Properties in Whiritoa average 4.6 out of 5 stars. Property 1: Walk straight onto the sand from your garden. Property 5: Spacious, sunny, modern bach. Beautiful Whiritoa beach house, newly renovated, by lagoon and beach. 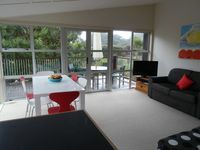 Property 13: Beautiful Whiritoa beach house, newly renovated, by lagoon and beach. Property 31: Beach Pad! Cross the road to the beach! 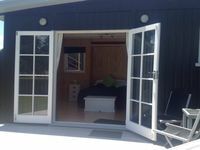 Property 37: Whangamata Estuary hideaway close to the beach and estuary. Wi-Fi and heat pump. Property 40: Comfy home opp Gilmour Lake.